Base Notes: Cedar and Lily of the Valley There is nothing as delicate as a rose, elegant and seductive. This floral blend opens with the fresh notes of Bergamot and Violet, which bring a captivating freshness and warmth to the fragrant perfume of Rose. Beautifully boxed; 80ml / 2.7 fl oz natural spray. Made in Spain UPC 8422385660013 Rosa silvestre: Elegante y seductora. La composición floral se abre con las notas frescas de la bergamota y la violeta, dando al perfume una frescura y calidez cautivadora. There is nothing as delicate as a rose, elegant and seductive. This floral blend opens with the fresh notes of Bergamot and Violet, which bring a captivating freshness and warmth to the fragrant perfume of Rose. Rosa silvestre: Elegante y seductora. 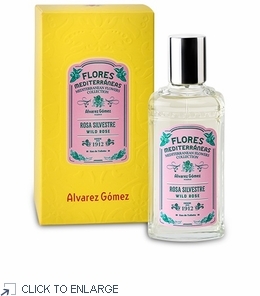 La composición floral se abre con las notas frescas de la bergamota y la violeta, dando al perfume una frescura y calidez cautivadora.